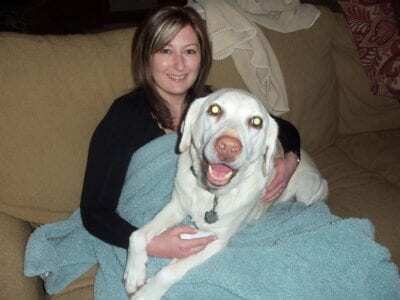 In honor of National Pet Month, I thought it was time to share the story of how we ended up with Maddie…and all her constantly shedding hair! 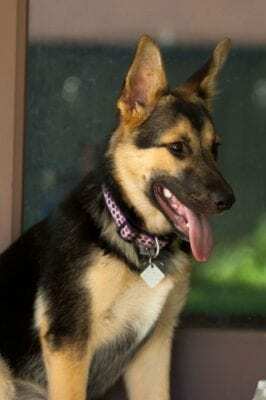 Before we get to that, I wanted to share some of my favorite tools and routines for dealing with the barrage of hair created by a German Shepherd. I know I can’t be the only one drowning in pet hair! Thanks to my friends at Swiffer™ for partnering with me on this post and asking me to help them bring awareness to pet adoption. 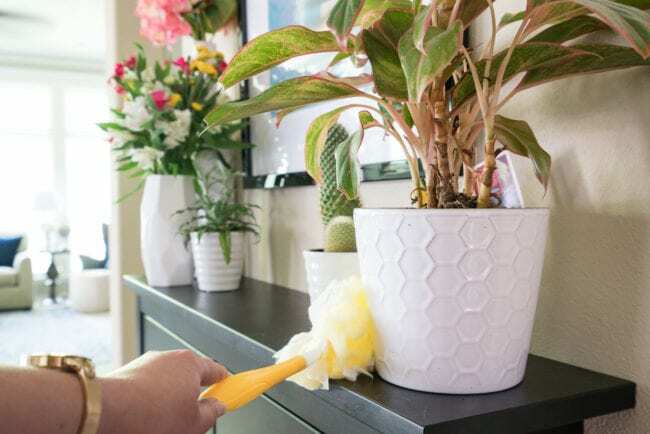 I’ve talked about them many times before and you may have even noticed my Swiffer Sweeper making an appearance in the recent Better Homes & Gardens feature! 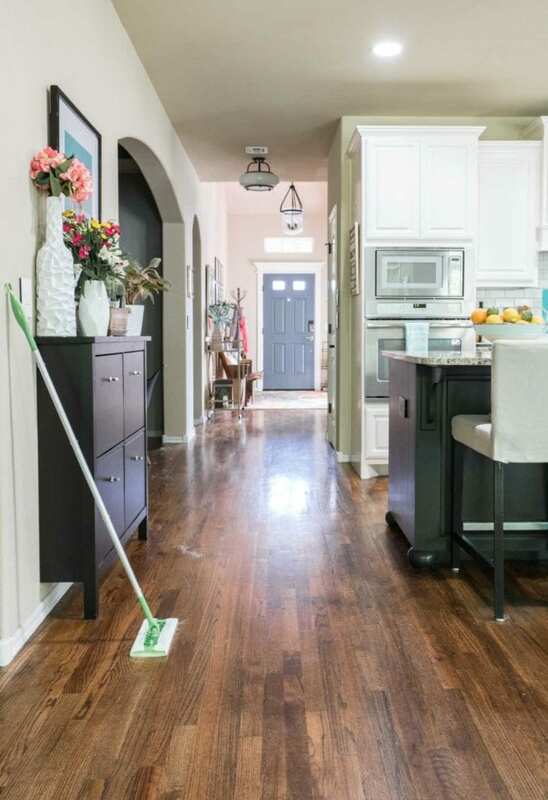 1) Do a quick clean up of hard floors DAILY. I resist adding things to our daily routine as much as I can, but I also don’t like waking up to tumbleweeds of Maddie hair. I was out of town over the weekend and told my husband NOT to do the floors while I was gone so I could get photos of what happens after 3 days. The pile of hair in front of the Swiffer Sweeper is just from this small area. You can see several more clumps back by the dining room chair. 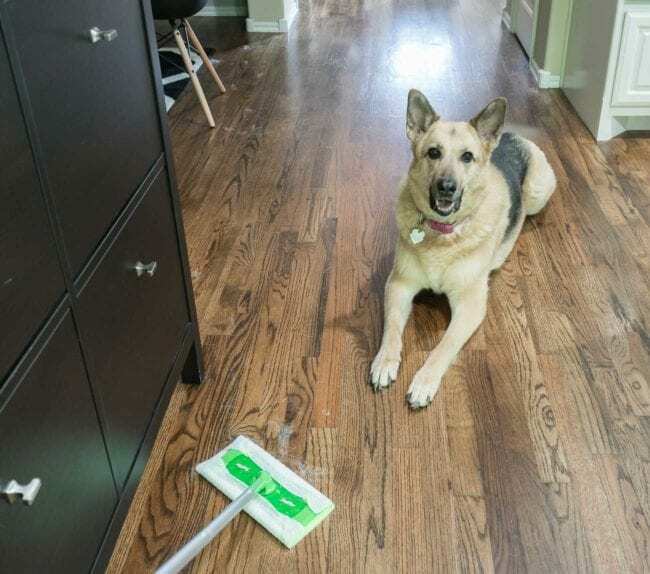 Unlike the vacuum, Maddie doesn’t mind the Swiffer, so it’s perfect for a fast and easy daily clean up of loose hairs. I love how it attracts the hair and clings to it. I’ve been inconsistent with getting this done at the same time daily, which makes it way too easy to skip days. I think it’s time to add it to the after-dinner routine so I can wake up to clean floors each morning. I’d recommend finding a time that works for you most days and set a repeating reminder on your phone to get into the new habit. If I miss this task a few days in a row, restoring the clean floors turns into a bigger production of having to vacuum out all kinds of nooks and crannies where hair accumulates. I probably could still vacuum the carpets daily as well, but that never seems to make it to the top of my list. As long as I keep the wood floors clean with the Swiffer, days between vacuuming can be stretched out. If you use Cartwheel in the Target app, there are 2 great coupons through June 2nd, 2018. And if you don’t use Cartwheel, you should! I just checked and I’ve used it for 252 items and a savings of $313 dollars over the years. 2) Don’t miss the other flat surfaces. We’ve found dog hair everywhere from ceiling fan blades to the top of our headboard. But that generally only happens when we’ve been slacking on the floors and lower surfaces – like the TV stand, end tables, etc. The slacking doesn’t happen as often since I switched to using the 360 Swiffer Dusters a couple years ago. The dust/hair-attracting material means that I can zip through quick whole downstairs in 10-ish minutes and without spraying any chemicals. I’m not moving everything to dust under it each time, just making sure I grab any new hairs or dust before they can creep anywhere else. I love these things so much that we have the regular 360 Duster handle and the heavy-duty extendable version! Thankfully, I don’t have to do this step daily as long as we’re keeping up with the floors, but it’s a weekly task at a minimum. Occasionally, we’ll do a deeper clean and actually move everything from surfaces. 3) Get the right brush for your pet and use it often. Maddie has a thick undercoat that literally comes out in huge clumps. And that’s in addition to the regular shedding of her top coat because #ShedHappens. For the first few years, we were using the same brush on her that we had for our lab. No matter how much we tried, it wasn’t that great at reducing her indoor shedding. The day I found a long tooth undercoat rake, brushing Maddie became a totally different and newly effective process! Researching the right style brush for your breed will make a big difference in your grooming routine. You guys…that photo of her rake was after I ran it down her side ONE time. SO MUCH HAIR. 4) Keep lint rollers handy. We have them in the house (they work well on the couch and pillows in addition to our clothes) and in each of our cars for those times Maddie tries to send her hair off with us. 5) Make sure you’re taking time to enjoy your pet. In all our rushing around, I can get frustrated when I see Maddie’s hair on the wood floors AGAIN. But I’ve noticed that on days I spend more time playing ball with her, I don’t mind the little extra time it takes to clean up. The joy having a dog brings to our house is priceless! To tell Maddie’s story, we have to go all the way back to the year 2000 and our first anniversary. Corey got me the best gift ever, a very white, yellow lab we named Jenga. She loved tennis balls and HATED any storms with strong winds. Before we knew it, it was 2010 and Jenga was still healthy, but when your big dog turns 10, you start to worry about the day you’ll have to come home to a house without them. That summer, a friend of ours was working on his Jeep in his driveway and a sweet puppy wandered up and plopped down next to him. He gave it one look and fell in love, but set out to try and find the owners. As the days wore on, they started thinking about what to do if no owners were ever found. Our friends REALLY wanted to keep the adorable dog that found them, but they had recently gotten married and their own dogs were still adjusting to living together. 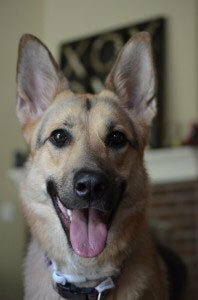 No one reported a German Shepherd missing to any of the shelters or online lost pet sites. They even put up “found dog” signs and took her to the vet to check for a microchip, but days kept passing with no solid leads. After 7 days with dwindling hope of finding an owner, our friends brought the big puppy over to see how she would get along with Jenga. Well…they thought they were just bringing her over for a test playdate. After a successful introduction, I convinced them she could just stay with us forever starting that night. We did all still look for any owners for awhile, but my theory is that they may have dumped her because she has hip dysplasia. The vet said she was 6-7 months old at the time. Her face was quite a bit darker then and seriously the cutest. Her ears were WAY too big for her head. She LOVED her new big sister, who seemed to be energized by having a younger playmate around. We were so lucky to have Jenga another 18 months, and losing her was so much easier with Maddie to comfort us. 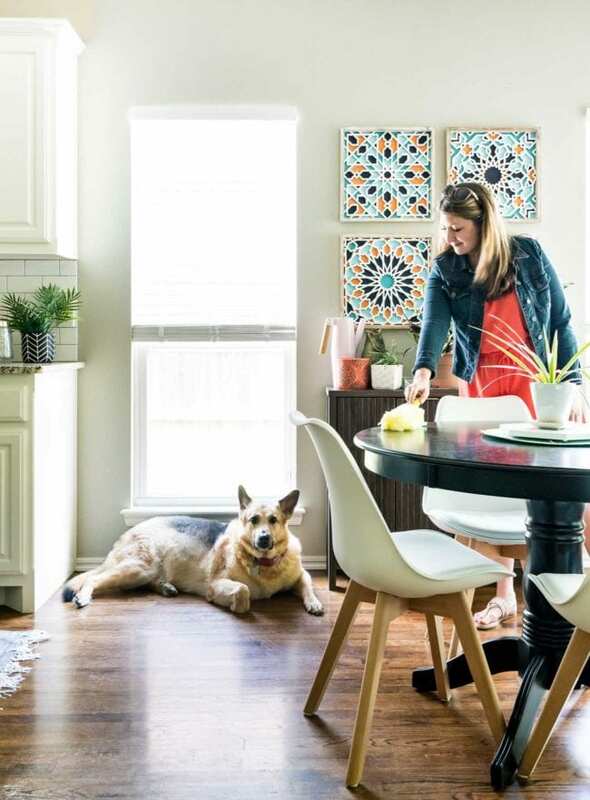 It does take a bit of extra housework when you’re a pet owner, but don’t let that be the barrier to adopting your own fur baby. 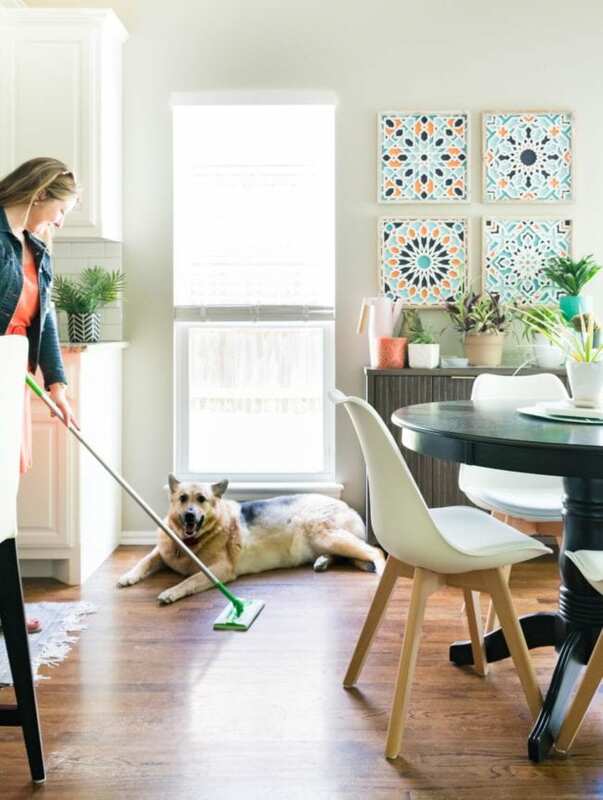 With a couple new routines and a Swiffer Sweeper, you can still have a clean house with a pet! It’s taken me awhile to figure out that taking the 10 minutes to do the wood floors daily reduces how often I have to do everything else. But now that I’ve got that figured out, puppy fever is setting in and I’m about ready to conquer two shedding dogs at once again. I, too, have an overabundance of dog hair everywhere. But each time I start complaining to myself, I think about how much love my two give me. Got one after a divorce and one found me seven months later. They literally saved me. So – what’s a little (lot) of dog hair everywhere. Glad to know others share the same dilemma.. I know what you are talking about!! YES! I bet they have a similar undercoat to the German Shepherd – the clumps that come out with our hands are insanity. And frankly, I’m glad I’ve not the only one that has considered whether it would be brilliant or insane to spin dog’s fur. You’ll have to let me know if you end up trying it! 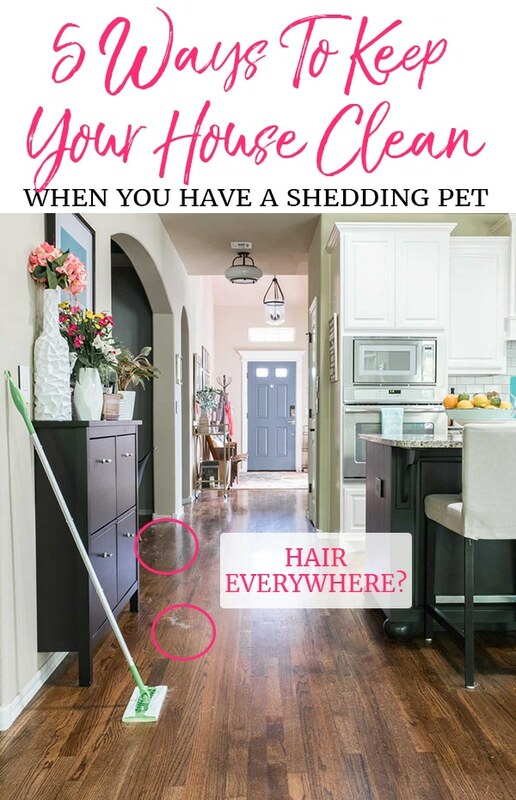 These are such great tips for dealing with pet hair! Our new puppy doesn’t shed, but most of our family has shedding dogs that are hard on our kids’ allergies. 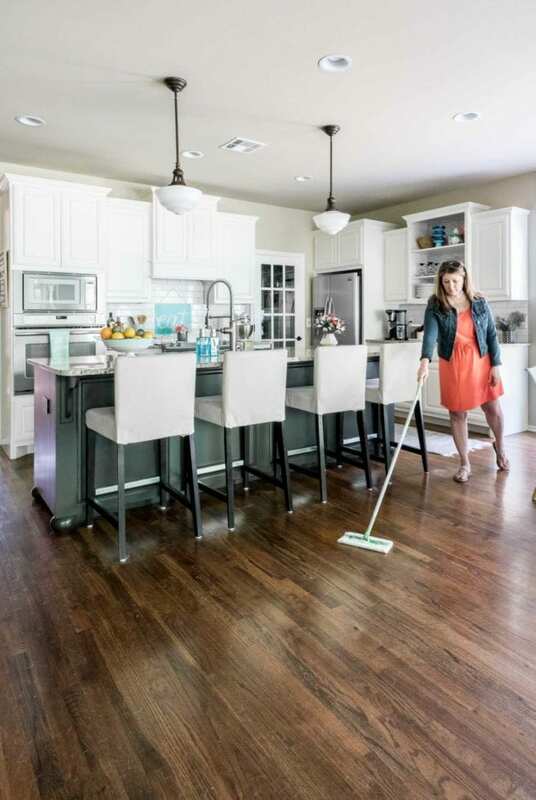 The Swiffer sounds like the perfect way to keep the dander in the air at a minimum for allergy sufferers! Yes! That’s a great point!